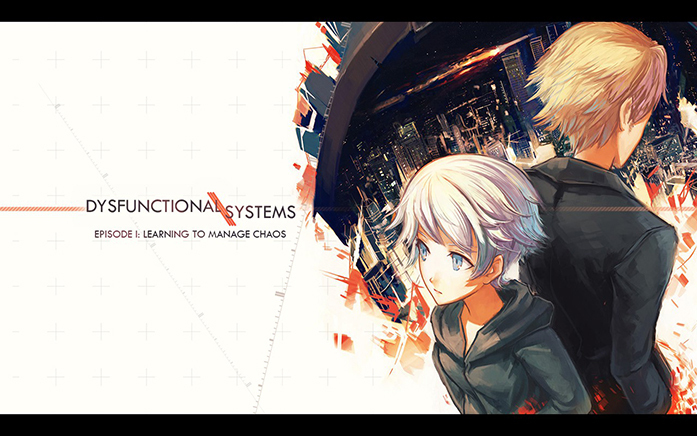 Dysfunction Systems: Learning to Manage Chaos is a visual novel. The only gameplay interactions are selecting occasional choices which branch the story in a certain direction. Depending on your choice you may only interact once throughout this two hour long story; spending your time reading the dialogue and enjoying the great art style and interesting narrative. 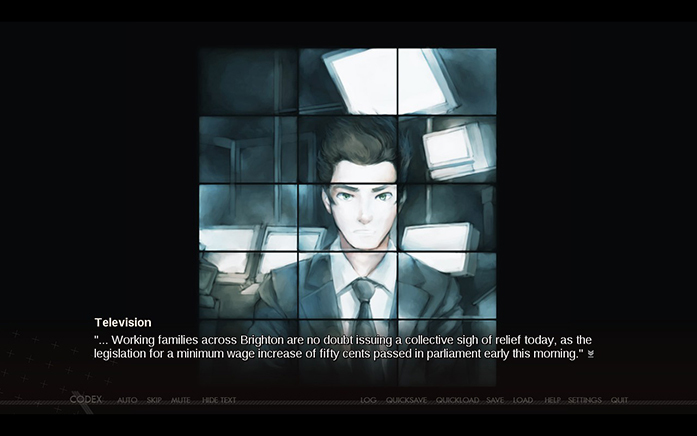 This was the first visual novel I've gone through (and the first to be on Steam, via Greenlight). Typically, the majority of visual novels in this style are Japanese, but this was made by a small team, Dischan, in Canada. 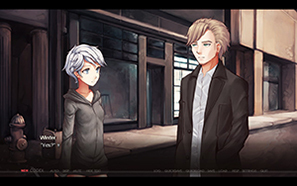 The story follows Winter, a young Mediator in training with her mentor, Cyrus. Mediators travel to other worlds where there are signs of chaos breaking out and do whatever it takes to restore order. They travel to the country of Brighton, where it is clear that something is going on. Briefed with only basic knowledge of the world, the two set off to find locals to engage in conversation in order to find out more about the impending potential trouble. As time goes on the trouble is revealed and the characters need to find a swift resolution to something they never expected. It is safe to say things escalate quickly. The characters are mostly well written. Winter is inexperienced, nervous about the headstrong nature of her tutor. She also questions and argues against nearly every tip and request from Cyrus, which became a little frustrating. Her internal dialogue is inconsistent too; not really believable sometimes given the context of their work. Cyrus is arrogant yet somewhat kind natured, but always trying to do what's right and what's needed. The two protagonists meet other characters along the way but there isn't much time for setting these up. The presentation throughout the entirety of Dysfunctional Systems is top class. There are sleek menus and the dossiers explaining some of things you come across are clear and well designed. 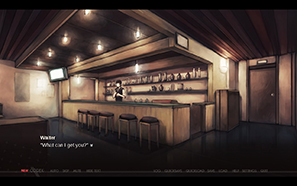 The game is presented in typical visual novel style; the text box at the bottom and the characters that are engaging shown on either side of the screen. There are a few basic animations but it's mostly static, with the occasional panning background. There is no voice work too, though this is okay as you get to go through at your own reading pace. There is a lot of dialogue in the game and voice work could make it very slow to go through without skipping. There are some pacing issues. Some scenes last too long, dragging on with seemingly filler text that adds little, and some (arguably the more important ones) fly by in a couple minutes. The events are set up well but I wanted to know more about certain later scenes. It also has a really strange endgame. After what I thought to be the end the game, it carries on with a late title card, and I thought it was much longer than I anticipated, that he part I thought was the main game was in fact the prologue. However, after twenty minutes this scene ended and so did the game. 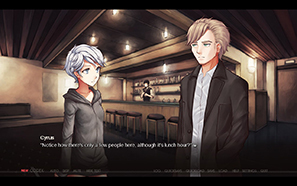 There is also no art for all but one of the new characters in this portion; the text displayed over the entire screen. It is almost as if this was a late addition, rushed out, or they ran out of money and resources. Dysfunction Systems: Learning to Manage Chaos has a mostly well written, mature and ethically testing narrative with gorgeous art. The soundtrack is great too, and comes free with purchase of the game. A warning though, this game ends abruptly, leaving me want more. Having recently run a successful Kickstarter the remaining two chapters are on there way, although not for a while. This was a pleasant way to spend a couple hours with my laptop on a lazy Sunday. Hopefully the company will be successful in their aim to make the next two chapters. The overall concept of a group of people that travel worlds to solve world problems is really interesting and I'd like to see where they go next.